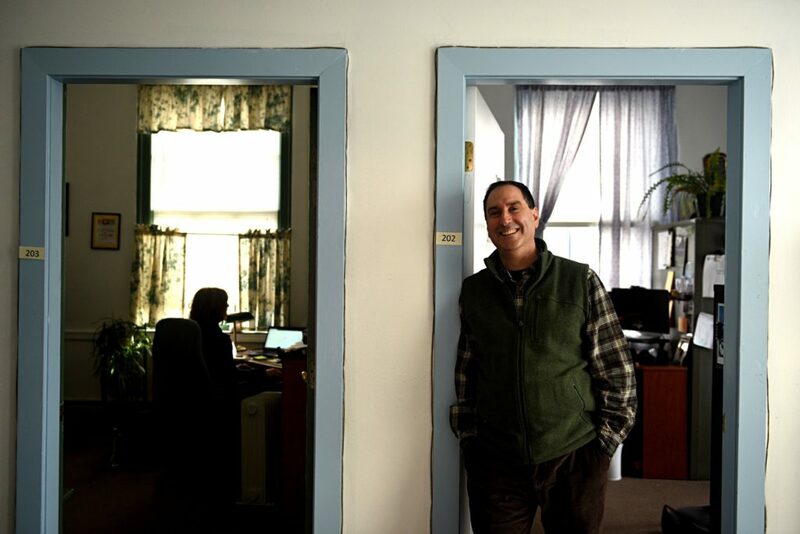 Photographed at his Newport, N.H., office on Jan. 7, 2019, Seth Wilner is a UNH Cooperative Extension specialist in farm business management. Wilner has facilitated five intergenerational transfers worth in total over $8 million in the past year. (Valley News - Jennifer Hauck) Copyright Valley News. May not be reprinted or used online without permission. Send requests to permission@vnews.com. Agricultural enterprises constantly confront swarms of problems and issues as they try to be profitable and sustainable, but often there’s one in particular that hovers over everything, that vexes the owners for years and, occasionally, spells doom for the business. It’s the matter of succession — what will become of the farm when the present generation ages out and whether or not there’ll be the talent, interest and wherewithal to carry it forward. The route to a successful transfer of a farm to a new generation of ownership can be a bumpy one, given all the financial and tax matters, and unfortunately, efforts can end up in a morass of anger and bitterness and even litigation. Underlying the whole undertaking are complicated emotions that invariably come with long-standing family commitments and deep attachment to the very land upon which the farm exists. There was a time when an Upper Valley farm came to a turning point — a transfer to the next generation by deed was a fairly simple process, or a call to an auctioneer could quickly disperse the animals and equipment and find bidders to purchase the real estate. As recently as the early 1970s, an intact hill farm hereabouts might be worth less than $100,000, but as the interstate highways arrived, land values began shooting upward rapidly, and the economic calculus of succession underwent dramatic change. 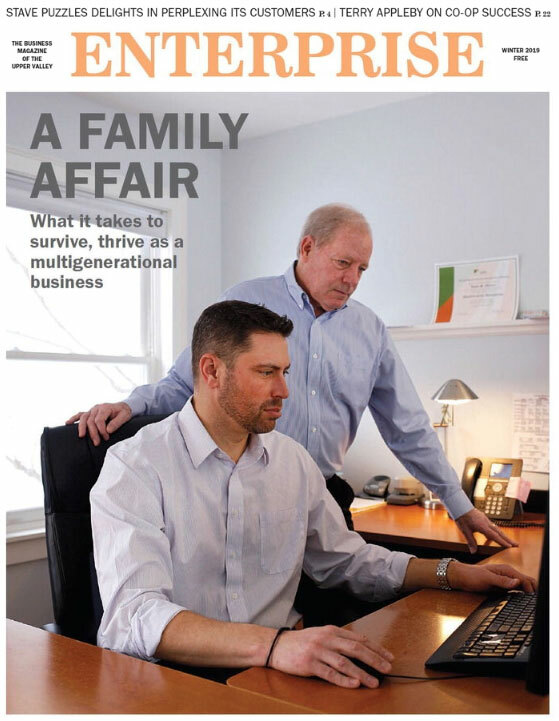 Here in 2019, creating a process by which a farm enterprise can move from one generation to the next, whether it’s in the family or outside, is invariably an arduous task that soaks up the time of attorneys, accountants, tax specialists and lenders. Then there may be people who can step in and help steer things in the role of facilitators. The University of New Hampshire Cooperative Extension has been deeply involved in farm succession work for more than a generation, and at any given time may have a score or more projects underway around the state. Just in Sullivan County, Extension farm management specialist Seth Wilner in the past year has facilitated succession projects for five farms accounting for assets valued at more than $8 million. Wilner begins a project by conferring with all parties considering a farm transfer to identify the individual goals of each of the players. Then he’ll prompt discussions of financial needs of the older generation: what amount of income will they need beyond Social Security, should they receive compensation in a lump sum or play it out over a period of years? Can the transfer be eased by leases rather than outright sale? How will the value of real estate, equipment and livestock be established, and what will the tax implications be? These discussions may go on for six or seven sessions, often one-on-one with the various parties involved. Wilner carefully avoids anything that could seem like taking sides as he seeks to identify where there’s common ground and where there will be a need for negotiation. He presses for participants to identify what sort of structure they would envision as the transfer takes place, such as a partnership, a limited liability corporation or some other vehicle. And who will be the boss until the process is complete? Tax planning is a huge part of any succession project beginning with review of depreciation already taken on assets, establishing current values for calculating capital gains and review of current profit and loss performance. This information needs to be organized and understood by all parties before things move to the next steps, which will include them meeting with tax advisers, attorneys and, especially, the lenders who currently finance the operation and who likely will be called on to restructure loans to accommodate the needs of the new owners or operators. While the dollars-and-cents matters are hugely important in determining whether a farm succession project will go forward, emotions can, and often do, play an even larger role than the money concerns. Wilner said it’s very rare these situations work out with no acrimony coming to the surface. He goes in expecting hidden grievances to come out, and they usually emerge in his sit-down sessions with individuals. Equity versus fairness is the most common flashpoint. There may be four siblings, three of whom have no interest in farming but want a quarter share of the value of the transfer in cash. If the fourth sibling has to borrow the money to buy them out, the farm probably won’t generate enough income of pay the debt off, and it will be doomed. Trying to resolve these situations can be exhausting, and Wilner may have to ship it along to the tax and legal people. He does find that a slow-motion transfer can sometimes yield a satisfactory outcome when initially things seem impossible. The incoming party usually has good financial skills already, but a matriarch who has kept the farm books for years can stick around and help with a gradual transition to new management. Working on farm succession projects year in and year out has taught Wilner that the biggest recurring issue is what’s called the five-year look back. Older people requiring nursing home care under Medicaid can face problems if they have gifted some of their assets to others in the previous five years. Wilner is only too happy to send that complicated issue along to professionals. Mike Sciabarrasi is a recently retired farm management specialist with the UNH Cooperative Extension, who has spent the past 25 years of his career working on farm succession matters around New Hampshire and as part of a New England-wide extension consortium on farm transfers. Extension has recognized that a key part of maintaining the imperiled heart of the region’s agricultural sector is helping existing farms to stay active. Sciabarrasi will say over and over that the biggest challenge is likely to be getting parents and their children on the same page about what’s to become of the family farm. He recounts a story of a farm where there were three generations of men in the initial discussions. Going in, it seemed like the grandfather was ready to pass the farm along to son and grandson, sort of a storybook outcome. But when Sciabarrasi sat down one-on-one with the grandson, it was clear the grandson had issues with his father and wanted no part of a partnership with him in continuing the enterprise. Many other stories have played out with similar twists and turns. There were several instances where the patriarch hung onto ownership and control far into old age, leaving bitter sons and daughters as virtual hired hands far into middle age. And some other succession efforts were dashed to bits by feuding among family members over what they believed to be their rightful shares or who would end up with decision-making authority in any eventual new ownership structure. Farm succession planning has grown ever more complicated and contentious in recent years, both Wilner and Sciabarrasi say, and in many cases can take several years of discussions and negotiation before they move forward, if they ever do. The University of Vermont Extension also is involved in assisting farm succession endeavors, as is Yankee Farm Credit, the farmer-owned financial services cooperative that covers Vermont, northeastern New York and the Connecticut Valley counties of New Hampshire.